Nothing makes a garden look more shabby than worn out, dated or broken fencing. Your lawns can be immaculate, your plants practically perfect, but if surrounding this gardeners’ dream is a nightmare of broken, discoloured fence panels and wonky fence posts, most visitors will struggle to see past this unsightly mess. Good quality, beautifully designed fencing can transform even the smallest of spaces but with so much choice on the market, where do you start when tackling this essential part of the garden? We spoke to the fencing experts at Fencestore www.fencestore.co.uk to find out their top tips when choosing fencing. What do you want your fencing to do? The answer to this question seems obvious but there are various different functions which fencing can perform. Think about whether fencing will be used to create a screened boundary between you and your neighbours, whether you want to use it to create different areas within your garden, or whether you would like to train plants up fencing to add interest. Boundary. Do you need to replace or create a definite boundary between your garden and your neighbours? Do you want full screening and what height do you need? If you are keen to retain privacy in your garden and have close neighbours, you may wish to consider 6ft (1.8m) high fence panels. 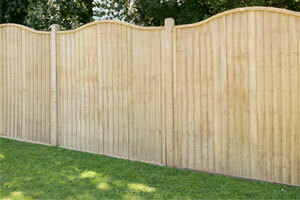 For boundary fencing, consider styles such as closeboard fencing, with feather edge panels that partially overlap, such as this 6ft wooden fence panel by Forest https://www.fencestore.co.uk/6ft-closeboard-panel-6x6 or solid fence panels such as this 6ft high pressure treated fence panel https://www.fencestore.co.uk/6x6-fence-plus-pressure-treated-board-wave-panel-fns. Triform technology has recently been incorporated into some fence panels to reduce noise up to 30 db, particularly useful if your garden is near to a road. We recommend the Forest Acoustic Noise Reduction Panel https://www.fencestore.co.uk/6x6-fence-plus-acoustic-noise-reduction-fence-panel-fns. Internal sectioning. In larger gardens, fencing is often used to section the garden into different areas, e.g. a play area for the children, a fruit and vegetable garden, lawn area, or simply to emphasise a beautiful flower bed. When choosing fencing to use within the garden, privacy is not normally a consideration, so think about decorative fence panels with lattice features, or more contemporary slatted panels. 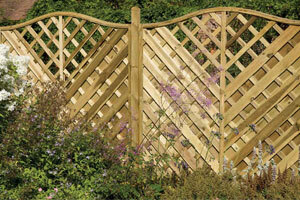 In traditional cottage gardens, the Paloma panel is a popular choice https://www.fencestore.co.uk/1800mm-paloma-horizontal-weave-trellis-6x6 whilst modern gardens would suit this Forest Slatted Panel https://www.fencestore.co.uk/6ft-high-fence-plus-slatted-panel. Trellis fencing. Dual purpose trellis fencing can work wonders in the garden as not only can it be used to provide a boundary or internal screen, but the integral trellis can be used to train climbing plants to add interest to the boundary and soften the hard lines. The High Versailles Panel features chevron panelling with a decorative curved trellis https://www.fencestore.co.uk/versailles-panel-180cm-high. Trellis toppers can also be added to fence panels to allow your climbing plants to flourish next to your fence and add additional height https://www.fencestore.co.uk/180cm-convex-trellis-fence-topper. Fencing can come in many different designs and you should consider the overall style of your garden and the look you are aiming to create when making the final choice. 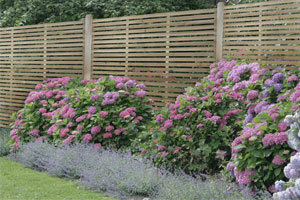 For a traditional simple garden, closeboard fencing gives a clean, fuss-free backdrop. We like these fully framed closeboard panels https://www.fencestore.co.uk/4ft-closeboard-panel-4x6. Featheredge fence boards can also be purchased separately should you wish to build a closeboard fence yourself. If you choose to DIY, you will need to buy fence boards, arris rails which run along the width of the fence, arris rail brackets, gravel boards and fence posts. DIY closeboard fencing is useful if the area you are working with is not compatible with the standard closeboard panels. Decorative and lattice fence panels are an ideal choice for a rustic garden with the flexibility to train climbers. The Forest Finedon Decorative Screen is a pretty choice for a flower-filled garden https://www.fencestore.co.uk/finedon-screen-fence-panels-180cm-high. Modern gardens demand contemporary fencing with sleek, clean lines. Many modern design schemes also feature painted fencing, a look easily achieved with good quality wooden fencing. Our top choice is the Forest Double Sided Slatted Panel, ideal for boundary screening https://www.fencestore.co.uk/6ft-high-fence-plus-double-sided-slatted-panel. How can you preserve the life of your fencing? New fencing products require minimal maintenance. If you want your fencing to look good for years to come, look out for wood which has been pressure treated, a special preservative process which protects against the elements and deters woodworm and fungal decay. All Shedstore’s fence products come with a minimum 10 year anti-rot guarantee, so you can be confident your new fence purchase will stand the test of time, and are Forest Stewardship Council (FSC) certified, which means wood is sourced from forests that are responsibly managed. To find out more about fencing, visit www.fencestore.co.uk or call 0333 003 0519.